Children love anything that involves water. They can play in the water for hours with or without toys. Children have amazing imaginations that they use to make playing more fun and magical. With the aid of some tools and toys, they can make the most out of their experience and also develop their cognitive skills. Playing combined with learning makes children grow healthier and more independent in the long run. As parents, we should see to it that we are giving them the correct toys to play with. It is important that we choose the toys we give them because it is where we can build a learning foundation for them – through play. If you are looking for toys that will not only give loads of fun to your children, but also help them develop the different skills, then take a good look at the list below for the best water toys for kids. Every child is fascinated by water and has a blast with it. What could be more fun than having your own mini water park? 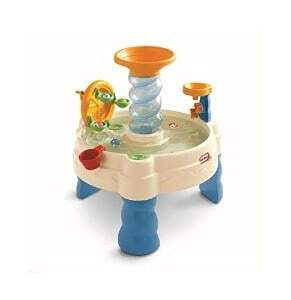 This Spiralin’ Seas Waterpark Play Table helps your child with their motor skills by scooping in water and having it flow out. The balls can be dropped in the funnel and your little ones can watch it roll down into the paddle wheels. Your kids can also pour water and watch it go down. This mini water park could accommodate up to a maximum of 7 gallons of water and includes a water cup and 5 characters for squirting water. What's Great About It: The fun squirting characters are good for your little one's motor skills and will bring countless hours of fun on a hot summers day. It only takes a short time to fill it up with water, so your kids can be playing in no time. When you want the best fun for your kids, check out this Slip N Slide Hydroplane Double. 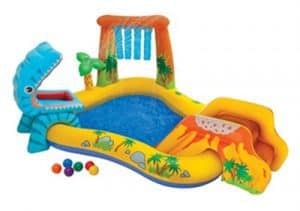 This 15 foot water slide includes 3 inflatable slide boogies which makes sliding easier and more fun. The sliding surface measures 18” from side to side, so your teenagers can get involved too. All you need to do is lay down this slide mat on a flat surface, inflate the two slide boogies after attaching the garden hose, and children will be able to have hours of water fun. The boogies are available in various colors, so you can choose one that your kids will love. What's Great About It: When it is too hot to handle the heat, cool down with this summer slide. This will not only give your children countless hours of fun, but they will learn to balance as they try different moves down the slide. Not only does this help them physically, but it encourages social and mental development. You don’t need to get wet to have fun with water. With these three fun activity books with refillable pens, your kids would be able to entertain themselves for several hours. This may not technically be considered as a water toy, but it is loads of fun for children. Creativity and motor skills are developed through this play. These are also great for bringing along when you are traveling as it is compact and easy to pack. 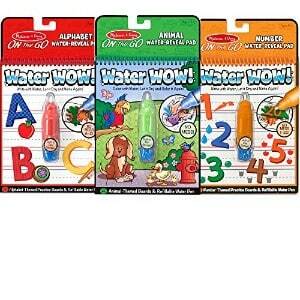 The On the Go Water Wow Bundle comes in 3 packs – animals, alphabet, and numbers. You can choose your child's favorite or select them all for hours of water fun. What's Great About It: The chunky pens make it perfect for little hands. This set brings out the imagination and creativity of your children from a young age. Hand-eye coordination is also strengthened as they learn the basics they will need for the rest of their lives. If your backyard is big enough for blasting fun, you better take a look at the Nerf Super Soaker Tidal Tube Blaster, because this toy will rock your child’s world. You could bring these to the beach, the pool or the lake. 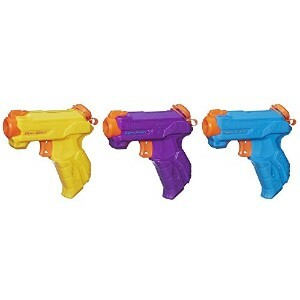 The blasters let your kids soak their target, and are great for team work or competitive play. The squirted water can reach 23 feet away, so no matter what size your backyard is, your kids can enjoy this blaster from Nerf, well known for making incredibly popular toy guns for kids. This blaster can hold 10 ounces in its canister, which is more than enough water for your kids to soak their friends or siblings. 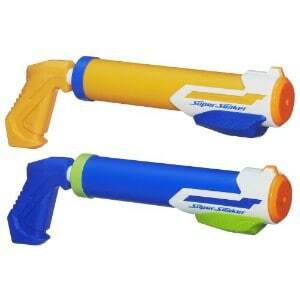 The package contains two water blasters, great for your little ones to use with their friends or with mom and dad. What's Great About It: Competition, imagination, and creativity will stimulate your child while they are at play with these blasters. The power of the blaster makes it even more fun to play with, and is great for hours of fun. If your child loves balloons and water, then these Bunch O Balloons are the perfect toy for your little one. This bunch comes with 105 balloons in red, blue and yellow colors. It takes less than a minute for you or your child to fill these balloons up. Your kids will be delighted to see the water balloons increase in size. It has an attachment which is easy to connect to the hose for easy filling of water. Who would have known that making balloons would be so fun and easy? What's Great About It: This set looks simple and easy, but for your little one, this may be the coolest water toy for them. They can fill the balloons themselves, therefore strengthening their problem solving abilities and spatial intelligence. This interactive hexagon could be your child’s favorite for the whole summer. This set comes with an interactive activity which will fascinate your children. 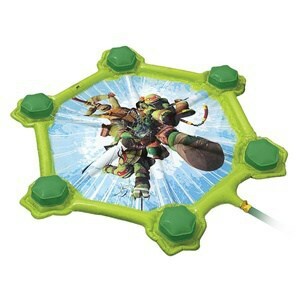 The Teenage Mutant Ninja Turtles Sewer Stomp and Splash Pad doesn’t need anything but a flat surface and a garden hose attached to its connection. Once you turn the water on, your kids will be delighted to see the water spraying from 6 different points - perfect for cooling them down and playing for hours on a hot day. What's Great About It: Balance and coordination are developed by playing on this pad. Your child's muscles will be strengthened and they will develop their coordination. With simple installation in your backyard or garden, this toy has the potential to keep your kids busy every day of summer. This four-pack of toys will encourage your children to learn how to swim. 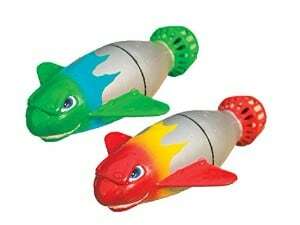 This is a set of 4 colorful dive toys which glide under water for a maximum of 20 feet. The colors are bright to make them easily recognizable, and the size is perfect for children to grab. The hydrodynamic design is great, especially for training your kids to practice swimming. These Toypedo Bandits are a must if your child is learning to swim or if they love diving for things in the pool. What's Great About It: These Toypedo Bandits give your children courage to learn to swim. They are encouraged to grab these toys under water, thus toning their arms, legs and abdominal muscles. 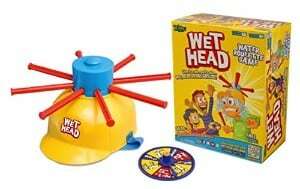 The Wet Head Game by Zing is like a fun children's version of Russian Roulette, but the only danger is of everyone getting really wet. The set includes a water hat with 8 holes around it as well as a spinner. This game is exciting and fun, especially when you are wearing the wet head water hat. What's Great About It: This game is perfect to play with friends or family members, and your child will have hours of fun. The wet head game is also great to take with on vacation. With 57 gallons of water, who would not have fun with the Dinosaurs Play Center. This inflatable paddle pool will be heaven for your little tots. It has flowing water from the palm tree and a waterfall which has a control valve for adjusting the flow of water. The Dinosaurs Play Center has a volcano water slide for more fun and an extra padded landing mat so your kids don't get hurt as they slide their way into the pool. The pool's floor has a drain plug which makes it easy to let the water out and pack it away after you are finished playing for the afternoon. What's Great About It: This is great for your backyard and it adds color to your surroundings. This set also develops creativity and imagination in your kids because they are in their own land of dinosaurs, volcanoes and waterfalls. Small holes can easily be repaired with a patch, so they fun can last all summer long. This sprinkler for children is suitable for any lawn size. This sprinkler toy may look very simple, but don’t be deceived. There are 12 splash patrol characters which spray water everywhere, bringing loads of splashes and fun to your children. This sprinkler is made from durable materials that can stand the test of time. This is simple outdoor fun for the whole family. And your grass gets watered at the same time. What's Great About It: The Sunny Patch Splash Patrol Sprinkler Toy can be enjoyed by the whole family. Active play is promoted by this sprinkler and for younger ones, this is great for coordination and muscle strengthening as they try to run away from the spray. If you want to teach your little one to fish, then this Toys Funtime Fishing toy by Tolo is the perfect first step. This toy will help your young child build patience, but fortunately they don’t have to wait too long before they catch their own fish. The magnetic worm that they will use as bait is sure to attract the best fish. The fishing rod is fit for the little hands and can reel the fish in. Your toddler will have loads of fun fishing for 3 colorful fish. You can use it during bath time or in a mini pool, where they can have tons of fun. 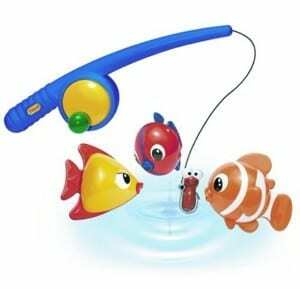 What's Great About It: The Tolo Funtime Fishing may look basic and simple, but don’t underestimate this toy as it is great for developing the motor skills of your child's little hands. The size of the reel and fish are perfect for gripping thus making it more fun and exciting for them to play independently. Whether you have a son, a daughter or both, the Super Hoops Floating Basketball Game will let them play together for hours. This game encourages friendly competition and sportsmanship. This isn't your regular basketball hoop as it can be played in the pool for a challenging and fun experience. The buoyant hoop is designed for maximum strength and durability, and it has 3 flotation devices surround it to make sure it stays upright at all times. 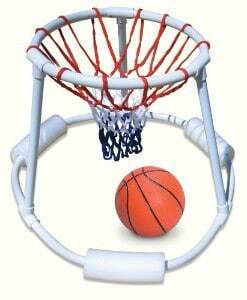 The basketball net itself is heavy duty and will be able to withstand a lot of force as your kids play. What's Great About It: This unique basketball hoop will develop your child's balance and coordination while in the water. The Super Hoops Floating Basketball Game entices kids to do more physical activity by shooting the ball and moving around the water. Water tables are always a hit for younger children, and this one is no different. The height is great for your little ones, but their older siblings can also enjoy playing at this table. This play set has a pond and 2 ducks on it. A slide and mini water turbine, which acts like a whirlpool in the middle, makes the water play even more fascinating. There is also a frog sprayer that will make your child giggle. These characters may be played with or without the water table itself. 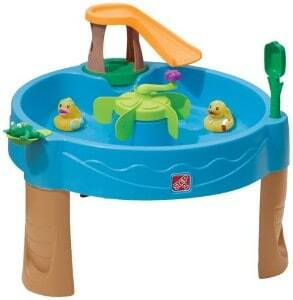 The Duck Pond Water Table has its own scoop that your child can use to move and play with the water. Your child can ease the ducks into the water down the slide, making for hours of fun. What's Great About It: This model would fascinate your little toddlers and encourage them to become more imaginative. This table develops their spatial intelligence as well as their motor skills, all while enhancing their creativity. This is a toy that your child of any age will enjoy. The Nerf Super Soaker Zipfire is made up of safe materials and has been tested for its good quality. The pack comes with 3 water blasters all in different colors. Your kids can spray water up to 20 feet away, perfect for in the pool or the backyard. Each of these soakers has a capacity of 3 ounces of water, so your kids will need to refill them as they go, but this only adds to the fun. The trigger is sensitive to the squeeze, so not much energy is needed to spray the water with maximum velocity. It also makes it easy for your little one to pull on. What's Great About It: Imagination and friendly competition are built through these water blasters. Children are encouraged to have active fun and creative play. The Nerf Super Soaker Zipfire is also a great toy for all the members of your family, so everyone can get involved. Your little ones will be mesmerized by Jet Skis and other water vehicles, so why not give them the Wave Rider Ride On? This may be not as fast as the real ones, but it will definitely give your kids hours of fun. 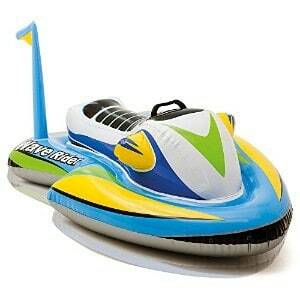 This inflatable Jet Ski is great for family holidays at the beach or in the pool. Can you just imagine your little one using their own creativity to ride their own jet ski? The wide base is enough to make this Jet Ski float and the handles are made from heavy duty materials for your kids to grab and hold on to. What's Great About It: This gem of a water ride-on toy is definitely great for developing balance and agility while holding onto the inflatable. But the best thing about this inflatable is that it looks so cool that your child will never want to get off of it. Designed as miniature water rockets, the SwimWays Turbo Booster can zip, flip and race while in the water. These battery operated toys will fascinate every child while in the water. 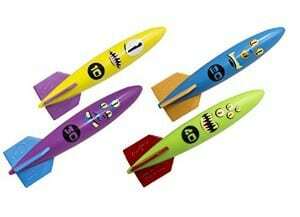 This toy uses one AA battery, and these water rockets are available in different colors. What's Great About It: Your child will be able to develop their creativity and imagination upon seeing these water rockets move around the water. In choosing the best water toys, safety was the most important factor we considered. We did extensive research in order to find out which toys are the best in terms of safety measures, quality and the ability to help in the development of your child’s physical, social, and emotional skills. We have also made sure that these toys will be loads of fun for your children, no matter how old or young they are, allowing them to keep cool for the summer. Playing is important for kids. There are so many toys available that help your child learn as they play. A child who is able to have a good play time will have a healthier outcome in life. This could serve as a good foundation for the coming years. Water is a good medium to make things more fascinating, and with the aid of these water toys, learning and playing is the perfect pair to reach the maximum potential for the development of your kids. For toddlers and babies, playing in the water brings so many benefits. They learn cause and effect by just touching the surface of the water. They are able to develop their motor skills and learn to balance themselves while in the water. Children love water so much, and need very little direction from their parents to have a fun afternoon in the swimming pool or at the beach. Please bear in mind that water is also dangerous, and you should not leave your child unattended, no matter what. Accidents do happen, and we should all be vigilant to ensure the safety of our children as they play.